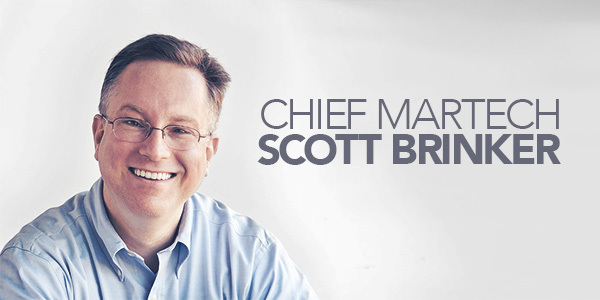 With deep roots in computer science and video gaming, Scott Brinker brings to marketing a unique perspective. He recently spoke with David Lewis on DemandGen radio to provide insights on the rise of Marketing operations as a role and function within marketing organizations and talk about what’s happening across the MarTech landscape. David: You have a degree in computer science. How did you get into marketing? Scott: My early background was as a software entrepreneur, but as all engineers learn, once you build it they don’t necessarily come. That’s when marketing comes into play. Early on, I was fascinated with the marketing world. At Ion, we were getting hired by our clients’ marketing teams to build out their marketing infrastructures, and I loved working with marketing teams and helping connect them to their IT organizations. The intersection between marketing and IT is fascinating to me. David: The MarTech conference is around the corner. What’s in store for this year? Scott: I’m excited at how much the conference has grown—it’s almost twice the size of last year’s conference. One of the challenges with such growth is you lose intimacy. To prevent that from happening, we’ve organized the show to feature tracks covering key trends. For example, there’s a track around “agile” marketing that speaks to an evolving cultural dimension of managing marketing in an organization. There’s also one focused on digital transformation, a process so many organizations are going through now. Of course, we’ll have a track covering emerging technologies such as AI and conversational computing. The schedule will be a wide mix, so people won’t get lost in the conference—they’ll be able to find sessions on the topics that matter to them. David: Your book, Hacking Marketing, was released at last year’s conference. Why should listeners pick up a copy? Scott: The book talks about where marketing and software collide—it covers lessons from the world of software management and development that are applicable to marketing teams. Agile marketing is one example. There are direct parallels between how software professionals manage the incredible rate of change in the digital world, and what Marketing is executing in terms of technology. The evolution has been fascinating to watch. It wasn’t too long ago we were only concerned about skus and products; now, marketing operations are the group running marketing—their work is at the heart of what powers marketing in an organization. David: How long will we be in the “golden years” of marketing? Scott: We’re going through a period of incredible change in the consumer environment, and also in the B2B market. We’re seeing innovations in conversational computing, virtual reality, immersive experiences — everywhere you turn there’s so much incredible innovation that’s changing the way people are interacting with each other. Right now it’s all greenfield—there’s no playbook yet. We’re inventing it as we go along. Marketing is where the action is, and I don’t think that will change in the foreseeable future. David: Have you been playing with virtual reality, and do you see it coming into the marketing mix? Scott: For virtual reality to really take off, all that needs to happen is ubiquity of the hardware, and it’s getting cheaper, faster, smaller and better every day. It’s a technology that’s applicable anytime you want someone to be able to “picture” what a product or service is like. It’s more effective than words or static photos or videos. Virtual Reality enables an incredibly interactive experience, and I think Marketing will have a heyday with it. David: Every year, you ask marketers to submit a one-pager on their marketing tech stack for the Stackie awards. Are you starting to see any trends? David: What about the MarTech infographic? Will there be a new one this year? Scott: We’re deep in the midst of creating it now. You’ll see a lot of consolidation, and some of the smaller companies will exit the landscape. But there’s also an incredible influx of new startups—some with impressive funding and some without. There are fewer barriers to entry, thanks to infrastructure from folks like Amazon and Google, and it’s easy to build and deploy new technologies. The landscape remains large and frothy and terrifying, and all those wonderful adjectives! David: Will there be a shiny new term or topic in the next year, or are we going to give marketers a break? Scott: Shiny new things will always pop up in the marketing world. For example, conversational computing—it wasn’t too long ago when Siri came out, but we weren’t thinking of that as a serious marketing channel. But at CES in January, Amazon Alexis was center stage. The fun and challenging thing about marketing are, we can’t predict what’s next—but we have to be ready to react. Find out about our next and other upcoming podcasts here.